Mobile health technology has the potential to transform the way we prevent and manage heart disease, but there are unanswered questions about how to optimize this technology and maintain engagement with patients, according to a review of randomized clinical trials published in the Canadian Journal of Cardiology. Cardiovascular disease is the leading cause of death worldwide. Recently, mobile health (mHealth) technology has been the focus of increasing interest as a means to improve the delivery of cardiovascular prevention targeting a combination of modifiable risk factors, which account for the majority of global risk factors for cardiovascular disease – in a scalable and affordable way. In this study, investigators review the evidence on mHealth interventions for simultaneous multiple risk factor reduction in both primary and secondary prevention settings, using smartphone applications (apps) and text messaging (short messaging service – or SMS). In the primary setting investigators found only a few randomized controlled trials (RCTs) that assessed mHealth approaches using text messaging and could not identify any RCTs assessing the effect of mHealth smartphone apps on total cardiovascular risk. The largest primary prevention text messaging study was an RCT conducted in China of a 12-month intervention comprising text messaging and phone calls performed among 589 Chinese workers who had been allocated to receive an annual medical examination, who were without cardiovascular disease, and between 45 and 75 years of age. The intervention group received personalized text messages targeting lifestyle measures to reduce cardiovascular disease risk (frequency determined by risk assessment) in addition to a computerized risk evaluation, an initial 15-minute face-to-face risk counselling session, follow-up phone calls, an educational handbook, and a medical examination. Electronic health prescription software was developed to prescribe the program to the intervention group. The control group received only the annual medical examination and report detailing their results. At 12 months, there was a significantly lower mean 10-year cardiovascular disease (CVD) risk score in the intervention group compared to the control group. However, there was no significant reduction in the mean cardiovascular disease risk at 12 months compared to baseline for the intervention group. The investigators concluded that the study was underpowered to detect differences in overall 10-year CVD risk, despite showing significant differences in the individual components of the risk score. Systolic blood pressure, total cholesterol, waist-to-hip ratio, and body mass index were all significantly lower at 12 months compared to baseline in the intervention versus controls. There have been several mHealth interventions designed to deliver secondary prevention to patients with cardiovascular disease and which target multiple risk factors simultaneously. Investigators evaluated the approach and the results of trials using text messages: TEXT ME and Text4Heart. A text-message based prevention program delivered on a smartphone (left) and a standard cellular phone (right). The TEXT ME program sends regular text messages to encourage participants to lead healthier lifestyles. Permission obtained from TEXT ME. 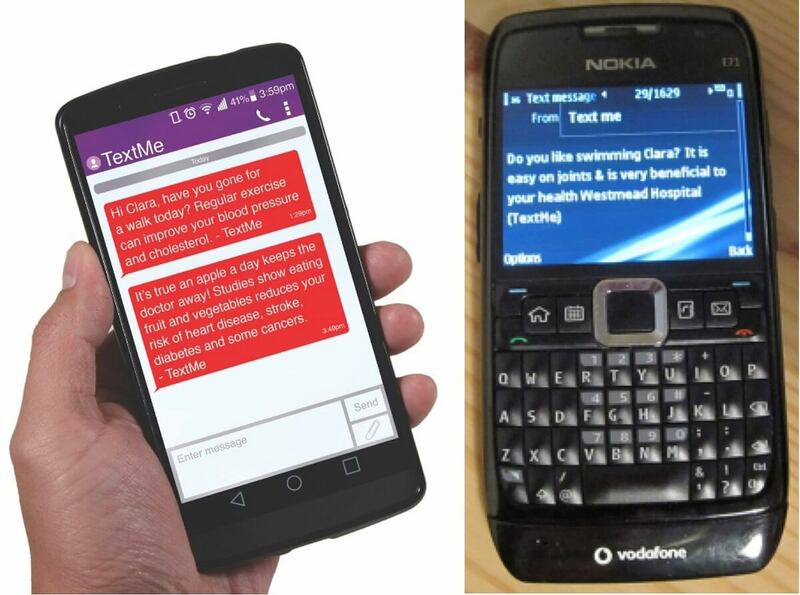 After six months, the TEXT ME trial, the largest secondary prevention texting study, provided objective evidence that text message support for heart attack survivors could improve key health risk factors of cholesterol, blood pressure, weight, exercise, diet, and smoking. Patients who received TEXT ME were more than twice as likely to reach guideline targets in their risk factors. The TEXT ME messages provided advice, motivation, and support on diet, quitting smoking, exercise, and general heart health. By contrast the intervention group in the Text4Heart trial received one message per day that decreased to five messages each week from week 13. The study identified positive effects of adherence to healthy lifestyle behaviors at three months but not at six months, raising the question about the durability of mHealth interventions, as well as the optimal frequency of text messages. Another two-month single-blind RCT of 203 patients with prior acute coronary syndrome evaluated personalized text messages based on cardiovascular data sent via mobile phone. The intervention group was significantly more likely to have an improved cardiovascular risk profile than the control group. An app-based secondary prevention program targeting individuals who have known ischemic heart disease. 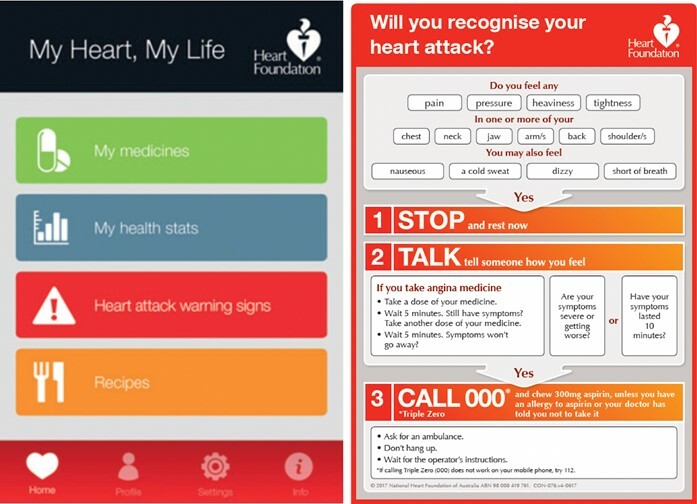 The “My Heart, My Life” app from the Australian Heart Foundation includes educational videos on acute coronary syndromes, and a personal health tracker. Reproduced with permission from the National Heart Foundation of Australia. The investigators also evaluated the results of three RCTs for secondary prevention using smartphone apps. They generally found no or small improvements in cardiovascular risk factors but concluded that the small trial sizes meant they were unlikely to be powered to detect small improvements in cardiovascular risk factors. They suggest that there is potential for reducing health service utilization and hospitalization, but that further research is required to clarify this. The article is “Breaking Barriers: Mobile Health Interventions for Cardiovascular Disease,” by Harry Klimis, MBBS, Jay Thakkar, MBBS, MD (INT MEDICINE), FRACP, and Clara K. Chow, MBBS, FRACP, PhD (https://doi.org/10.1016/j.cjca.2018.02.012). It will appear in the Canadian Journal of Cardiology, volume 34, issue 7 (July 2018) published by Elsevier. Full text of this article is available to credentialed journalists upon request. Contact Eileen Leahy at +1 732 238 3628or cjcmedia@elsevier.com to obtain copies. Journalists wishing to schedule interviews with the authors should contact Harry Klimis at harry.klimis@sydney.edu.au. Clara K. Chow is supported by National Health and Medical Research Council Career Development Award (APP1105447) co-funded by a Future Leader Fellowship from the National Heart Foundation.